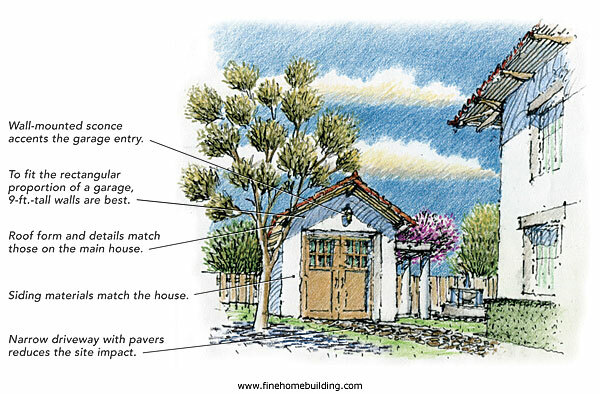 When designed well, a detached garage can add charm and character to a home. Separating the garage from the main house ensures that windows can be maintained on all sides of the house, maximizing daylight and views. A detached garage also improves the overall massing of the house, because the house appears less bulky without a garage. In addition to these aesthetic benefits, detached garages have functional attributes, such as limiting the amount of noise and pollution that filters into the house. Despite its many benefits, a poorly designed detached garage can have a negative impact on your home and lot. To make the garage complement the house and its site, observe this simple rule: Give the garage the same level of care as the house in terms of design and scale, and in the quality of the materials used to build it. Also, don’t make it too big. Generally, I recommend keeping the garage as small as possible. A garage that is too large will dominate the house. The garage should be only slightly wider than the width of a car with its doors open. To start planning a garage’s footprint, I figure on a depth of 18 ft. or 19 ft., depending on the type of car, and a width of 12 ft. for a one-car garage and 22 ft. for a two-car garage. I add at least 2 ft. to the depth of the garage if additional space for shelving is needed. Reducing the size of overly large elements can create a more comfortable and attractive appearance. For example, instead of creating a single-bay two-car garage, which demands a huge garage door, create two bays, each accessed with swinging carriage doors. 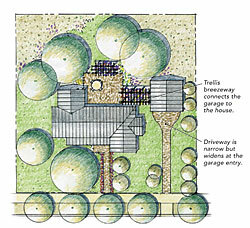 This approach will help to bring down the scale of the garage and make it more proportionate to elements on the house. Roof orientation also can have a large impact on the perceived scale of the garage. Gables facing the street generally reduce the perceived building height, which helps to establish the garage as a secondary structure to the house. If you desire a garage with a low-profile roof, a low-sloped hipped roof is a good alternative. The placement of the garage should take into consideration the relationship to the house and to the street. In general, it’s best to recess a detached garage from the street to de-emphasize its prominence on the site and to reinforce the perception that the garage is a secondary structure. This is also a common requirement of local zoning codes. In addition to setting the garage back, reducing the visual impact from the street by minimizing pavement at the driveway is also important. This can be accomplished by reducing the width of the curb cut and the driveway, and by using pavers and landscaping. While the garage should be secondary to the house, it should not be completely isolated from it. 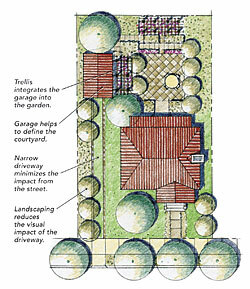 Allow for a small breezeway, trellis, or path between the garage and the house. These treatments give a sense of continuity from the house to the garage and help to define the outdoor areas of the home with small courtyards or garden spaces. When possible, the design of the garage should draw inspiration from the style of the house. 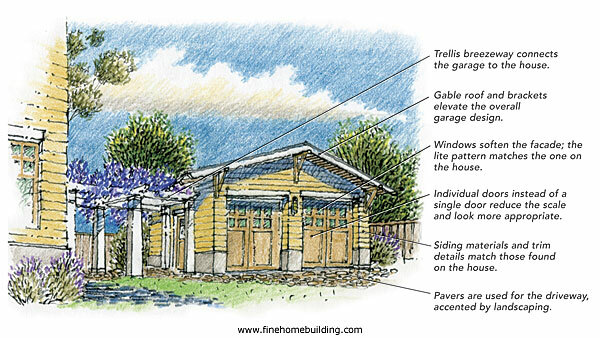 This means that the garage should have the same roof slope, cladding, window treatments, and trim details as the house. If the house doesn’t have a distinctive style or a defined character, you can exercise a bit more flexibility in introducing details, which can be inspired by contemporary or traditional styles. At the very minimum, the garage should have the same roof shape and slope as the house. Similarly, regardless of style, use quality materials to construct the garage, and avoid synthetic materials, such as vinyl, or rough finish surfaces, such as T-111 plywood siding. When it comes to garage doors, I prefer carriage doors. Whether you incorporate carriage doors or an overhead garage door, include windows in each unit. For carriage doors, I specify at least a third of the paneled surface to be windows. A larger amount of glazing is generally more appropriate with contemporary designs, but no matter the style, glazing softens the facade. When the windows are designed with a similar lite pattern as the windows on the house, the entire design feels more cohesive.